Additive manufacturing, or 3D metal printing, is planned to “go systematic” across Wärtsilä Group a based on plans to create a dedicated research centre in Vaasa, on the west coast of Finland. Researchers from ABB, Wärtsilä and two universities will collaborate, with construction for the R&D centre planned to start in 2019 or 2020. Material Solutions – a Siemens business – has been opened in Worcester, UK, following a £27 million investment. On a 4,700 square metre site, experimental laboratory processes in Selective Laser Melting (SLM), or 3D printing, are turned into industrial practice in the production of gas turbine components, saving time and money. 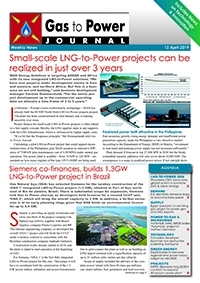 Indonesia and the Philippines, archipelagos within the Association of Southeast Asian Nations (ASEAN), are in focus of MAN’s new integrated LNG-to-Power solutions. “We have new projects under development mainly in Asia and western- and northern Africa. But this is a business we are still building,” said Carsten Dommermuth, business development manager at MAN Energy Solutions. In Gibraltar, meanwhile, an 80 MW project is already under commissioning. Carbon capture and hydrogen are interdependent; hence the resurgence of strategic interest in hydrogen is strongly connected with carbon capture in multiple ways. “The most basic is the source of hydrogen: today it is fossil fuels with over 10 tons of CO2 emitted for a ton of H2,” said IEA chief economist Laszlo Varro. Utilities around the global are understood to have halted operations of at least 18 of GE’s HA turbines at power plants following blade oxidation corrosion issues. The technical issues are reportedly very similar to a recent GE turbine blade failure at Exelon’s Colorado Bend power plant near Houston. Japan’s Kawasaki Heavy Industries has spent $175 million to develop a floating gas-fired power plant, fuelled by LNG, and aimed at Southeast Asian market. The power ships will be offered to utility customers on remote islands and in isolated locations with underdeveloped gas pipeline infrastructure. Digital twinning, the creation a digital replica of physical assets, is “already out of date, out of synch – simply because the twin is not alive,” said Robert Yeager, president of Power & Water Solutions at Emerson. Instead, he advocated “real-time synchronization” of the power plant and digital asset representation. Remote management of medium-speed Bergen engines will be made possible via Rolls-Royce’s new end-to-end platform for secure collection, transfer, storage, and analysis of engine data. The aim is to reduce downtime and lower operational costs. Testing of the new remote monitoring tool has been underway for more than a year. Intermittency issues of wind and solar power supply are feared to jeopardize the stability of the U.S. electricity network. To remedy this issue scientist at the Massachusetts Institute of Technology (MIT) have developed an “air-breathing” battery storage that, at the cheapest, run about $100/kWh and functions only in certain locations. Commissioning is underway at the Bioenergy Carbon Capture and Storage (BECCS) pilot plant at Drax Power Station near Selby in North Yorkshire. The 6-month pilot project was realized at a cost of £400,000, and is meant to capture 1 tonne of CO2 per day. ABB Ability Ellipse solution will support Ameren Illinois’ multi-million dollar modernization of their power grid in Illinois. The asset performance management software has a “prescriptive approach”, which will allow Ameren to better predict and prevent the failure of mission-critical equipment that delivers electricity to 1.2 million customers. With the advent of utility-scale energy storage and hybrid power systems, traditional power producers are turning to system integrators to balance multiple generation assets and optimize the energy produced. 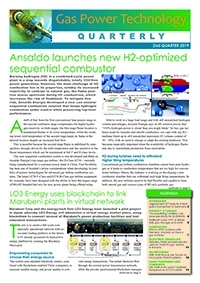 Wärtsilä’s GEMS software helped ALTEO Group optimise an engine power plant with energy storage in Hungary, and on the Azores the software used a mircogrid form of AI to control and balance wind, solar and diesel gensets.